Analysis: Jackson was previously entering the last year of the contract he originally signed with Tampa Bay in March of 2017. This re-worked deal likely lowers his $10-plus million cap hit for 2019 and keeps the deep threat under Eagles control through 2021. 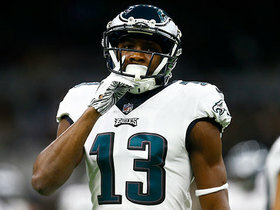 With Golden Tate and Mike Wallace no longer around, Jackson is joining Alshon Jeffery and Nelson Agholor at the top of the wideout depth chart in Philadelphia. Analysis: Jackson thus returns to the team that drafted him in the second round of the 2008 draft. Although he's entering the twilight of his career as a 32-year-old, he still led the NFL with 18.9 yards per catch in 2018 en route to a 41-774-4 line in 12 games. With Golden Tate, Mike Wallace and Jordan Matthews set to depart as unrestricted free agents, Jackson is slated to work in concert with Alshon Jeffery (ribs) and Nelson Agholor in the starting lineup next season. Jackson (Achilles), who was inactive for Sunday's 34-32 loss to the Falcons, finished the 2018 season with 41 receptions (on 74 targets) for 774 yards and four touchdowns. He also rushed six times for 29 yards and another score. Jackson (Achilles) is inactive for Sunday's Week 17 tilt against the Falcons, Scott Smith of the team's official site reports. Analysis: As expected, Jackson will be in street clothes for what's increasingly expected to be his final game in Tampa. The disgruntled veteran has made no secret of his desire to play elsewhere in 2019, so an offseason divorce appears highly likely. Both Chris Godwin and Adam Humphries stand to benefit from Jackson's absence Sunday. Jackson (Achilles) is listed as doubtful for Sunday's game against the Falcons, Greg Auman of The Athletic reports. Analysis: Absent from practice throughout the week, Jackson doesn't seem to have much shot at playing in what could be his final game with the Buccaneers. 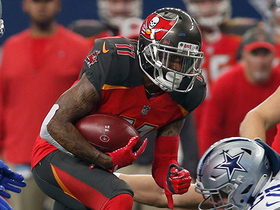 The team can free up $10 million in cap space by releasing him after the season, with no shortage of alternatives at wide receiver in the form of Mike Evans, Chris Godwin and Adam Humphries. The presumed Week 17 absence should free up a few more snaps and targets for Godwin outside. Jackson (Achilles) wasn't spotted at Friday's practice, Greg Auman of The Athletic reports. 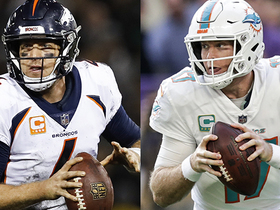 Analysis: Jackson looks as though he will miss his third straight practice and is certainly trending in the wrong direction for Sunday's game against the Falcons. The 32-year-old has expressed his desire to leave Tampa Bay after the season, according to Josina Anderson of ESPN, so he very well may have played his final game with the Buccaneers. Jackson's status will receive further clarity once the team posts their official injury report Friday. Jackson (Achilles) wasn't in attendance for Thursday's practice, Greg Auman of The Athletic reports. Jackson (Achilles) has expressed a desire to part ways with the Buccaneers at the conclusion of the 2018 season, Josina Anderson of ESPN reports. Jackson didn't practice Wednesday due to an Achilles injury, Carmen Vitali of the Buccaneers' official site reports. Jackson wasn't present at the portion of Wednesday's practice open to the media, Eduardo A. Encina of the Tampa Bay Times reports. Analysis: After missing the previous three games due to a thumb injury, Jackson returned for the Week 16 loss to the Cowboys, only to leave the contest for a spell due to a foot concern. He brought in just one of his four targets for 24 yards, marking his third-fewest yards in 26 appearances as a member of the Buccaneers. The reason for his lack of activity will be included on the team's first Week 17 practice report, which will be released later Wednesday. Jackson brought in one of four targets for 24 yards and rushed once for four yards in the Buccaneers' 27-20 loss to the Cowboys on Sunday. Jackson (foot) reentered Sunday's contest in Dallas, Eduardo A. Encina of the Tampa Bay Times reports. Analysis: After a brief stay on the sideline due to a foot issue, Jackson has been cleared to return. He'll look to build upon the one reception (on three targets) for 24 yards and one carry for four yards that he posted prior to his departure. Jackson is questionable to return to Sunday's contest at Dallas due to a foot injury, Scott Smith of the Buccaneers' official site reports. Analysis: In his return from a three-game absence, Jackson exchanged complications with his left thumb for a foot issue, but not before recording one catch (on three targets) for 24 yards and one rush for four yards. If he remains sidelined, Chris Godwin and Adam Humphries will take on expanded roles in the passing attack yet again. Jackson (thumb) is active for Sunday's Week 16 tilt against the Cowboys, Scott Smith of the team's official site reports. Analysis: Jackson makes his return to action after a pair of full practices to wrap up the week foreshadowed his potential active status. The veteran has missed the last three games with his thumb injury, but he'll presumably slide right back into the No. 2 role alongside Mike Evans versus a stingy Cowboys secondary. Jackson's return bumps Chris Godwin, who'd secured just one of 13 targets over the last two games, back into a timeshare of the No. 3 receiver role with Adam Humphries. Jackson (thumb) is officially listed as questionable for Sunday's game against the Cowboys, Greg Auman of The Athletic reports. Analysis: The injury designation shouldn't be taken as a sign that Jackson is any real danger of sitting out. The wideout was a full participant in practices Thursday and Friday, with coach Dirk Koetter stating after the latter session that Jackson would be active in Week 16, per Jenna Laine of ESPN.com. After missing the past three games, Jackson likely won't be handed a huge snap load right away and will presumably have to share work with Chris Godwin. Coach Dirk Koetter confirmed Jackson (thumb) will play in Sunday's game at Dallas, Jenna Laine of ESPN.com reports. Analysis: Jackson returned to practice as a limited participant Wednesday and followed it up with a full session Thursday. He'll likely split playing time with Chris Godwin, who logged a snap share of 80 percent or higher each of the past three weeks. Mike Evans has been the only reliable producer when all the Tampa Bay wideouts have been healthy, with Godwin, Jackson and Humphries alternating big weeks. Jackson (thumb) was a full participant in Thursday's practice, Jenna Laine of ESPN.com reports. Jackson (thumb) was a limited participant at Wednesday's practice, Calvin Watkins of The Athletic reports. Jackson (thumb) returned to practice Wednesday, Rick Stroud of the Tampa Bay Times reports. Analysis: Jackson's thumb required one month of recovery before he could make an appearance at practice, a span in which he missed three games. Stroud relayed Jackson looked good while catching passes, but his activity level won't be known until the release of the Bucs' first Week 16 injury report later Wednesday. Jackson (thumb) hopes to end a three-game absence Sunday in Dallas, Rick Stroud of the Tampa Bay Times reports. Analysis: Jackson hasn't practiced since injuring his left thumb on Nov. 18, so his ability to take part in drills and maintain participation this week will be key for the Buccaneers' decision-making process. Anything short of that may spur coach Dirk Koetter to shut Jackson down yet again, which would allow Chris Godwin and Adam Humphries to keep a hold on significant roles. Jackson (thumb) has been ruled out for Sunday's game in Baltimore, Rick Stroud of the Tampa Bay Times reports. Analysis: A non-participant at practice throughout the week, Jackson never seemed to have much chance of avoiding a third consecutive absence. While there hasn't been any cause for optimism regarding his availability for Week 16 or 17, the Bucs have yet to rule him out beyond Sunday's game in Baltimore. Chris Godwin and Adam Humphries are locked in for steady playing time alongside Mike Evans in three-wide formations. Jackson (thumb) was not spotted at Friday's practice, Greg Auman of The Athletic reports. Analysis: It's looking like Jackson will not be able to practice at all for the second week in a row, so his chances of suiting up Week 15 are not promising. The Buccaneers will reveal whether or not Jackson has any chance to play Sunday when they release their final injury report of the week following Friday's practice. Jackson (thumb) isn't participating in Thursday's practice, Greg Auman of The Athletic reports. Analysis: While managing a thumb injury that has made grasping the football difficult, Jackson hasn't practiced in any capacity in more than two weeks and looks poised to miss a third consecutive game Sunday in Baltimore. Jackson's ongoing absence has been most beneficial to second-year receiver Chris Godwin, who has drawn a combined 16 targets the past two weeks. Jackson (thumb) isn't practicing Wednesday, Eduardo A. Encina of the Tampa Bay Times reports. The Buccaneers list Jackson (thumb) as out for Sunday's game against the Saints, Luke Johnson of The New Orleans Times-Picayune reports. Analysis: Jackson failed to practice in any capacity this week, making it inevitable that he would be ruled out for a second straight contest. Chris Godwin benefited the most from Jackson's absence in the Week 13 win over the Panthers, pulling in five of six targets for 101 yards and a touchdown. The second-year wideout could continue to earn plenty of attention from quarterback Jameis Winston on Sunday with the Saints expected to have top cornerback Marshon Lattimore trail Mike Evans for most of the day. Offensive coordinator Todd Monken admitted after Friday's practice that Jackson (thumb) is unlikely to play Sunday against the Saints, Greg Auman of The Athletic reports. Jackson (thumb) wasn't spotted at the portion of Friday's practice open to the media, Eduardo A. Encina of the Tampa Bay Times reports. Analysis: It's possible Jackson could get some work in behind the scenes, but it's more likely he will miss practice for the third day in a row, which would set the stage for him to miss his second straight game Sunday versus the Saints. The Buccaneers will reveal whether or not Jackson has any chance to play this week when they release their final injury report of the week later Friday. Jackson (thumb) didn't participate in Thursday's practice, Greg Auman of The Athletic reports. Analysis: As anticipated, Jackson didn't fit in any activity behind closed doors after he wasn't spotted on the field in the media-access portion of the session. After sitting out the Week 13 win over the Panthers and with back-to-back absences at practice to open Week 14, Jackson looks to be trending toward another inactive status Sunday against the Saints. Jackson (thumb) wasn't on the field for the portion of Thursday's practice that was open to the media, Eduardo A. Encina of the Tampa Bay Times reports. Analysis: Jackson's absence from practices Wednesday and Thursday adds further fuel to the notion that the wideout likely won't be available for a second straight game Sunday against New Orleans, if not shut down for the season. Chris Godwin took on a heightened role while Jackson sat out the Week 13 win over the Panthers, finishing with five receptions for 101 yards and a touchdown on six targets. Jackson (thumb) is listed as a non-participant on Wednesday's practice report, Greg Auman of The Athletic reports. Analysis: Given that he was listed as a limited participant all last week, the downgrade to no practice may fuel speculation about Jackson missing the rest of the season. He was ineffective while playing through a thumb injury Week 12, and the Tampa offense didn't miss a beat with Chris Godwin taking on a larger role in Jackson's absence Week 13 against the Panthers. The 32-year-old wideout doesn't seem especially likely to return for Sunday's game against the Saints. Jackson (thumb) wasn't with the main group for the portion of Wednesday's practice open to the media, Eduardo A. Encina of the Tampa Bay Times reports. The receiver was able to complete some running work off to the side, according to Rick Stroud of the Tampa Bay Times. Jackson (thumb) has been ruled out for Sunday's game against the Panthers, Scott Smith of the Buccaneers' official site reports. Jackson (thumb) was a limited participant in Thursday's practice, Greg Auman of The Athletic reports. Analysis: Although Jackson was on the practice field for the second straight day, he wasn't spotted catching passes Thursday, according to Rick Stroud of the Tampa Bay Times. The wideout continues to sport a cast over his left thumb, something that could affect his ability to reel in passes during Sunday's game against the Panthers. If Jackson is held out of that contest or has his playing time restricted as a result of the thumb concern, Chris Godwin would likely benefit the most from an uptick in snaps. Jackson (thumb) was listed as a limited participant at Wednesday's practice, Greg Auman of The Athletic reports. Jackson sported a brace on his left thumb at Wednesday's practice, Greg Auman of The Athletic reports. Jackson (thumb) is visiting with a specialist in New York on Monday to determine the best course of action for handling his injury, Greg Auman of The Athletic reports. Analysis: Jackson played through the injury in Sunday's 27-9 win over the 49ers, catching three of eight targets for 19 yards in a game where quarterback Jameis Winston was otherwise extremely efficient. It's hard to say if Jackson's thumb issue played a role in the lackluster performance, but even if it wasn't a factor, he may prefer a cautious approach without the motivation of a possible playoff appearance. An absence in Week 13 against Carolina would free up snaps and targets for Chris Godwin. Jackson will be re-examined Monday after playing through a thumb injury in Sunday's 27-9 win over the 49ers, Rick Stroud of the Tampa Bay Times reports. Jackson brought in three of eight targets for 19 yards in the Buccaneers' 27-9 win over the 49ers on Sunday. He also rushed once for six yards. Jackson (thumb) is active for Sunday's Week 12 tilt against the 49ers, Scott Smith of the team's official site reports. Analysis: As expected, Jackson will suit up and assume his usual No. 2 role. Jackson initially hurt the thumb in last Sunday's loss to the Giants but returned to the game, and he'll look to reestablish chemistry with Jameis Winston versus a middle-of-the-pack 49ers secondary Sunday. Jackson (thumb) is listed as questionable for Sunday's game against the 49ers but is expected to play, a source told Ian Rapoport of NFL Network. Analysis: Despite the questionable designation technically making Jackson a 50-50 proposition for the weekend, there never seemed to be much concern about his availability after he put in full practices Thursday and Friday. Fantasy managers who have been relying on Jackson will still want to confirm his status when Tampa Bay releases its inactive list 90 minutes prior to the 1 p.m. EST kickoff, but it's highly likely the wideout will suit up and take on a normal snap count in Week 12. Jackson (thumb) is listed as questionable for Sunday's game against the 49ers, despite logging full practices Thursday and Friday, Greg Auman of The Athletic reports. Analysis: Jackson's ability to practice without any limitations on consecutive days suggests he should be fine to handle his usual role in a middle-of-the-pack matchup against a 49ers defense that's allowing 8.4 yards per target to wide receivers. While he's done his best work this season with Ryan Fitzpatrick under center, Jackson did catch a 60-yard touchdown from Jameis Winston in a Week 8 loss to Cincinnati. 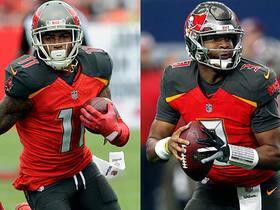 The Bucs are turning back to Winston as their starter for Week 12. Jackson (thumb) was listed as a full practice participant Thursday, Jenna Laine of ESPN.com reports. Analysis: Jackson's limited session Wednesday stemmed from the thumb injury that forced him to the sideline for a spell this past Sunday against the Giants. However, the issue clearly was minor after he elevated to "full" one day later. With the swap of Ryan Fitzpatrick to Jameis Winston under center, Jackson's ceiling on a weekly basis may have been lowered. Helping Jackson's cause for targets, though, is the loss of tight end O.J. Howard (ankle/foot) for the season. Jackson (thumb) was listed as a limited participant at Wednesday's practice. 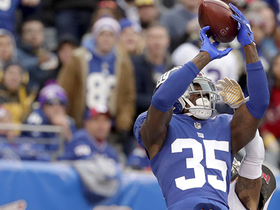 Jackson, who exited Sunday's 38-35 loss to the Giants briefly in the third quarter due to a thumb injury, eventually returned and finished with four receptions (on seven targets) for 38 yards. 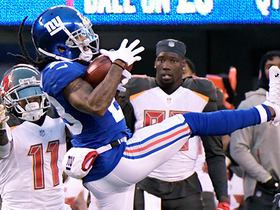 Jackson is questionable to return to Sunday's road game against the Giants, Scott Smith of the Buccaneers' official site reports. Analysis: At the time of his departure in the third quarter, Jackson had two catches (on two targets) for 26 yards. As long as Jackson is sidelined, the Buccaneers will have Mike Evans, Chris Godwin, Adam Humphries and Justin Watson available at wide receiver. Jackson caught five of eight targets for 67 yards during Sunday's 16-3 loss to Washington. Jackson brought in two of four targets for 32 yards in the Buccaneers' 42-28 loss to the Panthers on Sunday. 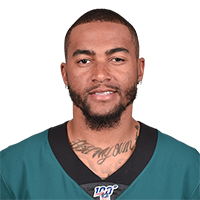 NFL Network Insider Ian Rapoport explains what the Tampa Bay Buccaneers and Philadelphia Eagles are getting in the trade involving wide receiver DeSean Jackson. 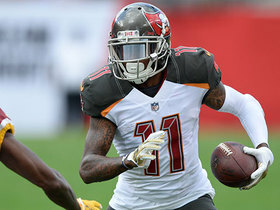 NFL Network's Mike Garafolo reports the latest on wide receiver DeSean Jackson's future with the Tampa Bay Buccaneers. 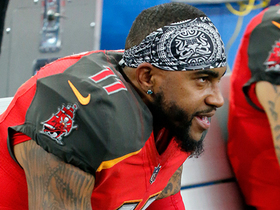 Steve Smith Sr. discusses why wide receiver DeSean Jackson is unlikely to return to Tampa Bay next season. 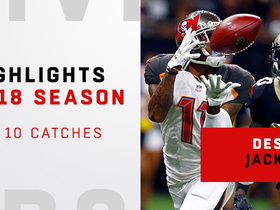 Watch Tampa Bay Buccaneers wide receiver DeSean Jackson's best catches in the 2018 season. Tampa Bay Buccaneers wide receiver DeSean Jackson grabs a catch for a 24-yard gain against the Dallas Cowboys. New York Giants cornerback Janoris Jenkins and linebacker Alec Ogletree make a combined effort to intercept the ball and return it for a touchdown. 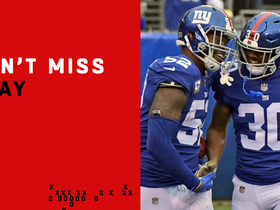 New York Giants cornerback B.W. Webb hauls in an interception to seal the win. Tampa Bay Buccaneers quarterback Ryan Fitzpatrick throws his third interception of the day on a deep ball attempt.